Spokesman calls PA incitement findings 'logically unacceptable,' demands conference to respond; accuses Israel of building to scupper talks. 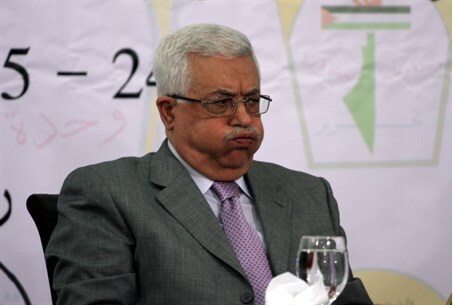 A spokesman for Palestinian Authority (PA) Chairman Mahmoud Abbas on Tuesday accused Israel of trying to bring down the peace talks by announcing construction plans on 272 housing units in Judea and Samaria. The spokesman, Nabil Abu Rudeineh, further attacked Prime Minister Binyamin Netanyahu's recent statements against evacuating Hevron and Beit El, claiming that Israeli building is a deliberate attempt to sabotage US Secretary of State John Kerry's "great efforts" to advance peace talks. Netanyahu criticized the PA refusal to recognize Israel as the Jewish state on Monday, and indicated support for Hevron and Beit El remaining Israeli. “We are not strangers in Beit El, we are not strangers in Hevron," said Netanyahu, indicating his opposition to withdrawing from the two communities that are not part of "settlement blocs." His stance comes even as reports show Netanyahu offered to cede most communities in Judea and Samaria in a long-term land lease. On Monday, Rudeineh spoke about the findings on PA incitement by the Intelligence Affairs Ministry, which documented how dehumanization of Jews and idolization of Nazi leader Adolf Hitler has only risen during talks. Rudeineh called the findings "grave" and "logically unacceptable," and further demanded a three-way conference between the US, the PA and Israel to respond to the "accusations." The charges of PA incitement are being used by Netanyahu to avoid the peace talks, according to Rudeineh's claims. He further accuses Netanyahu of pursuing a policy of increasing the Jewish presence in Judea and Samaria and "oppressing the Palestinian people." While Rudeineh may claim the accusations of PA incitement threaten to scupper peace talks, chief Israeli negotiator Justice Minister Tzipi Livni gave perfunctory criticism of the incitement on Sunday even while pledging that it will not stop peace talks. The spokesman concluded his tirade by claiming Israeli policy is in opposition to international law and human rights, whereas the "struggle of the Palestinian people" is legitimate. The accusations follow similar statements by Abbas's spokesman in November, in which he called the building of Jewish homes in Judea and Samaria "a crime against humanity."